The relationship between textiles and memory is something that resonates very strongly with me. We all have something of someone we once loved, I was recently given a rug made by my grandmother, I have a suitcase of my brother’s clothes, and we all associate clothes with particular events in our lives big and small. Textiles are something so intrinsic to us, we inhabit them, they are us, and although perhaps archaeologically they’re not given the attention they deserve compared to say more masculine topics such as ceramics or metallurgy, their importance can scarce be overestimated, both in its use to cover and protect the body, to portray status and of course in the staggering amount of time that would have been devoted to the production of fibre, the creation of thread and the construction of fabric. The relationship of fabric and memory is also something that is intrinsic to rag rugs. They’re made of clothing which instantly imbues memory and association into their construction, and indeed some rugs are specifically made from the clothes of the dead to make ‘memory rugs’, or from the clothes of a now grown up child. I have an original pre-war rag rug and it’s hard not to wonder what memories were once part of it and now, because of my ignorance, are gone. Who wore that coat, what were their names, what did they do, what happened to them wearing it, something good, something bad? And of course the rugs themselves evoke very strong memories in those who remember them in their grandparent’s homes or remember them being made; at the Arts Trail Emma and I constantly witnessed people being instantly transported to their childhood and the security and relationships they knew. So you can imagine how chuffed I was when an invitation came my way to attend the opening of a new exhibition at Salts Mill, ‘Cloth and Memory’. A more apt place for such an exhibition is hard to imagine, Salt’s Mill of course famously produced astronomical quantities of fabric each year, and since the beginning of its more recent renaissance, thanks to Jonathon Silver, it has always been associated with art and not least with his collaboration with David Hockney. The three exhibitions were specific responses to Salt’s Mill and the theme of cloth and memory. 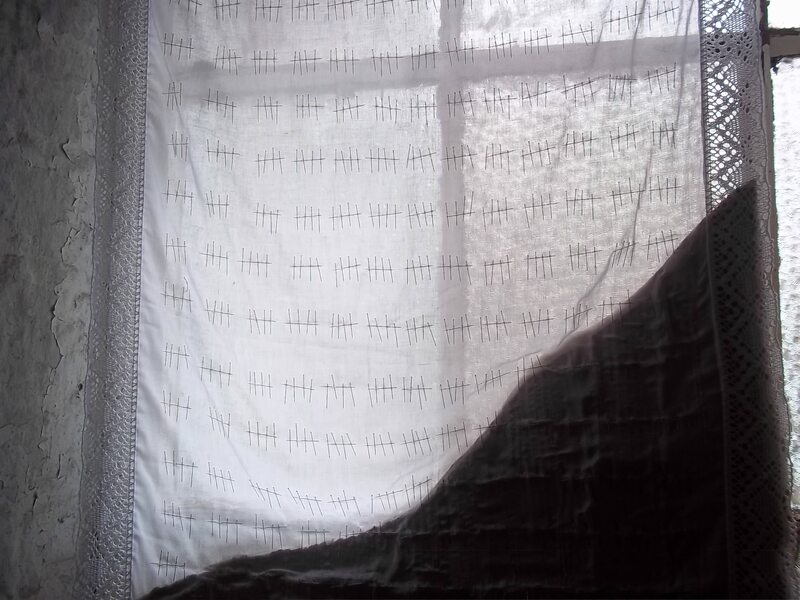 Of particular interest to me was Beverly Ayling-Smith’s use of cloth to explore the transition from bereavement to that eventual state where one learns to co-exist with one’s grief. 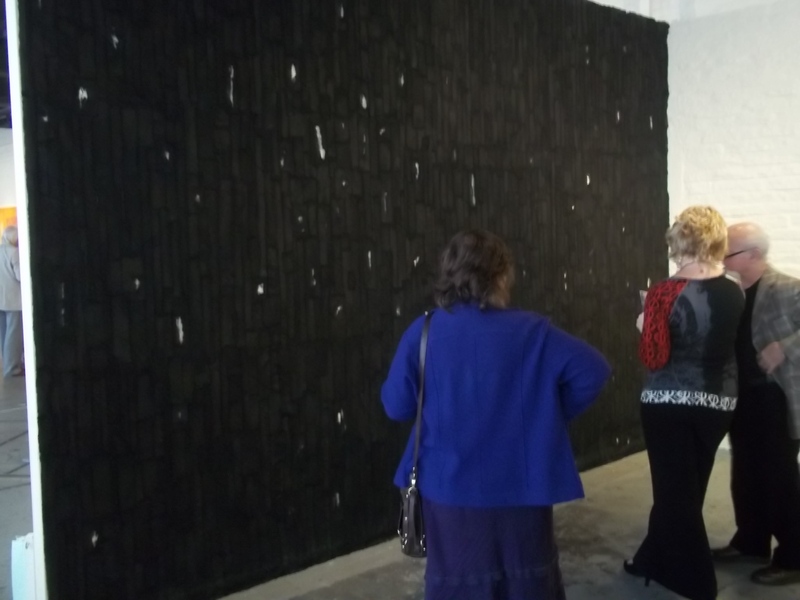 The first piece, ‘remembering, repeating and working through’ was made from scraps of thin black cloth sewn together and I don’t know if it was because of its overwhelming size, or its own attempt to hold itself together, but it instantly drew out something very dark, visceral and all consuming, it was bereavement. 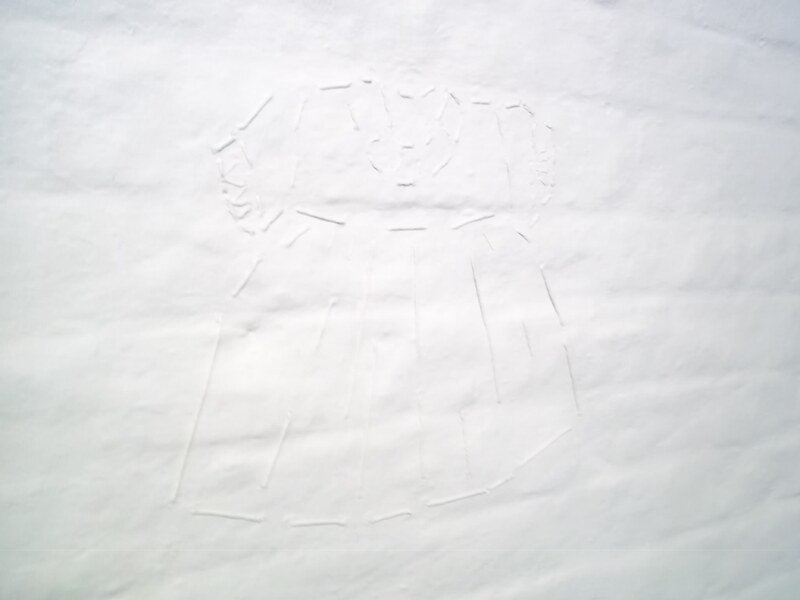 Easy to miss, but equally stunning was ‘Embedded memory’, an outline of a child’s dress looking as though it had been sewn into the brick. 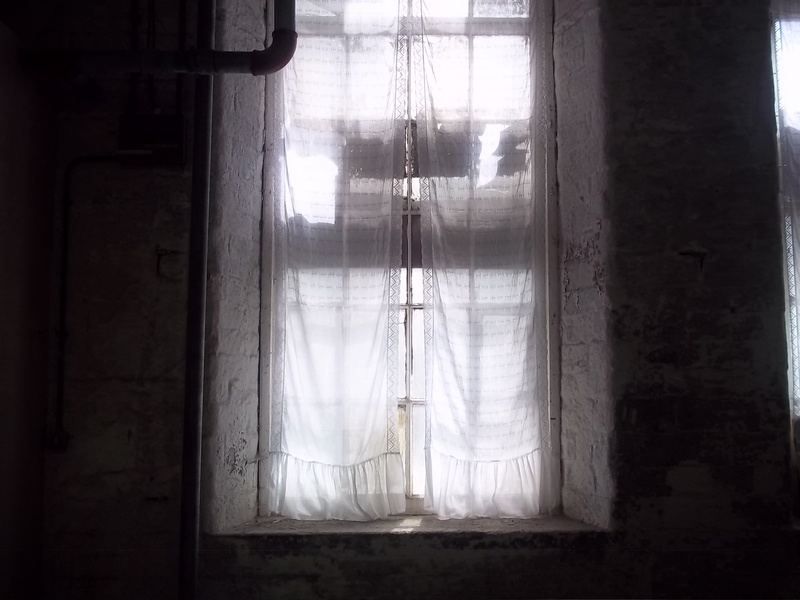 In a room previously not open by the public was Carol Quarini’s exhibition; she used the open and blocked windows to show the fossilisation of curtains into the mill’s brickwork, the curtains covered in pins tallying days much like a prisoner would. As an exploration of the transition of the domestic into the industrial, both in one’s life and the production of cloth, I thought it was fabulous. As the saying goes, I’m not an artist, but I know what I like, and I can’t recommend a visit highly enough; it runs until the 27th of August. You can find more details at the Cloth and Memory website here. 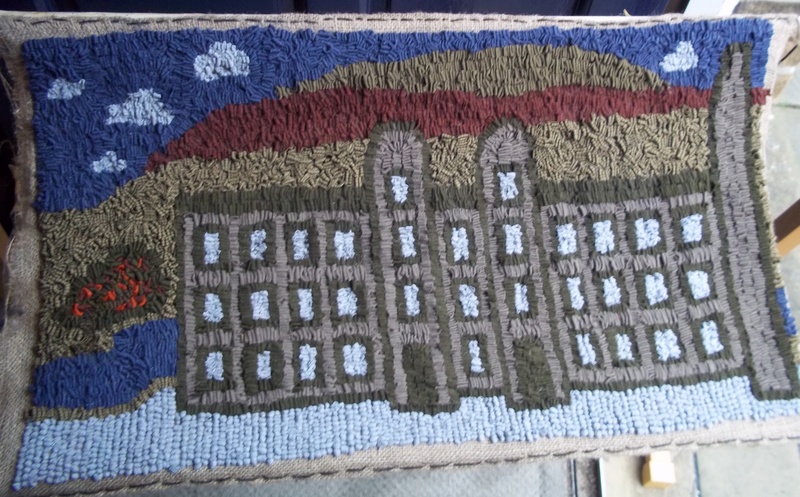 Salts mill hooky mat finished! 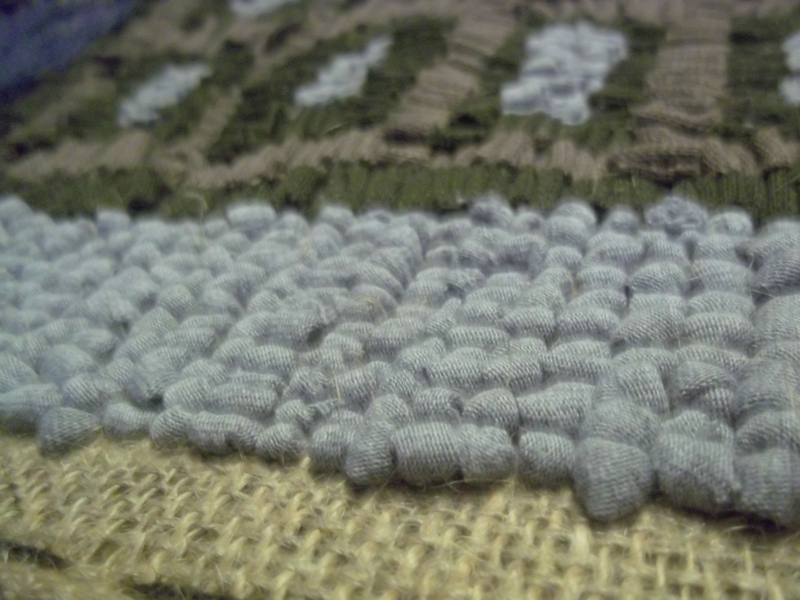 Hurrah – I’ve finished my first rug! Well nearly, still got to cut it from the frame and do a backing. 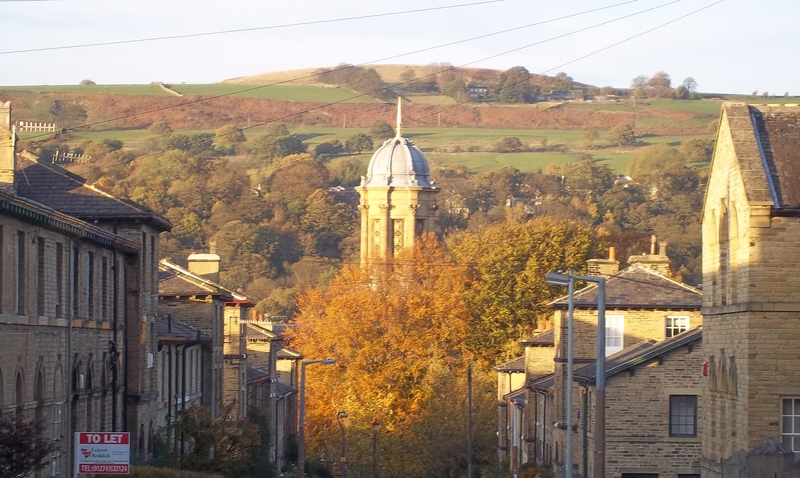 Living in Saltaire, Salt’s Mill is an obvious choice of design. I had wanted to do something similar for a canvas work but never got round to it. I thought the design would be a good one for a hooky mat because it was quite linear, but as it turned out those windows were a real pain! I also had to do something quite rectangular thanks to the stupid way I had cut the hessian. This time of year the hill that forms Saltaire’s backdrop has the most spectacular red stripe across it. Initially I wasn’t going to do a chimney but without it the building could have been anything; the chimney has meant things are more squashed to the side of it than I would have liked but it seems to be ok. At first I had thought to do spirals for the clouds but they just didn’t look right and I couldn’t see why I was doing something quite so abstract and so plumped for more traditional shapes in the end and am glad I did. When I started this my fabric stash was quite limited and so there isn’t much in the way of shading, but actually, I quite like the blocks of colour, it seems to give a strong effect. 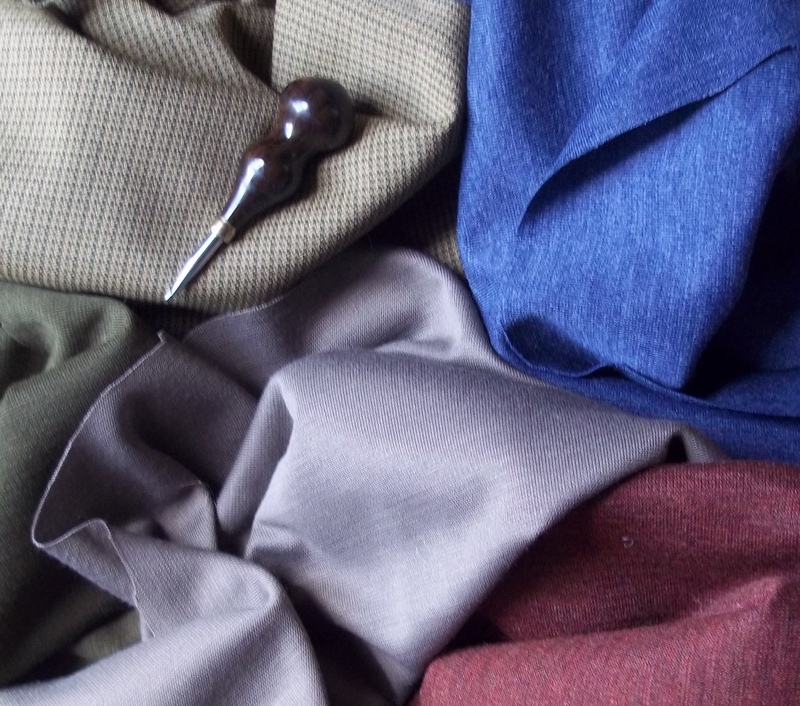 Most of the fabrics are jerseys but the moorland and tree trunk are from some vintage suit lengths. The top of the moor and the layer beneath the red stripe are the same fabric with different sides of it showing. The clouds, windows and cobbles are from an old grey t-shirt. For the windows and clouds the fabric strips were cut and worked randomly but for the cobbles I ripped the fabric quite wide so they curled in on themselves forming more rounded and regular shapes. The grey did tend to flake but I used some sellotape to lift them from the fabric. 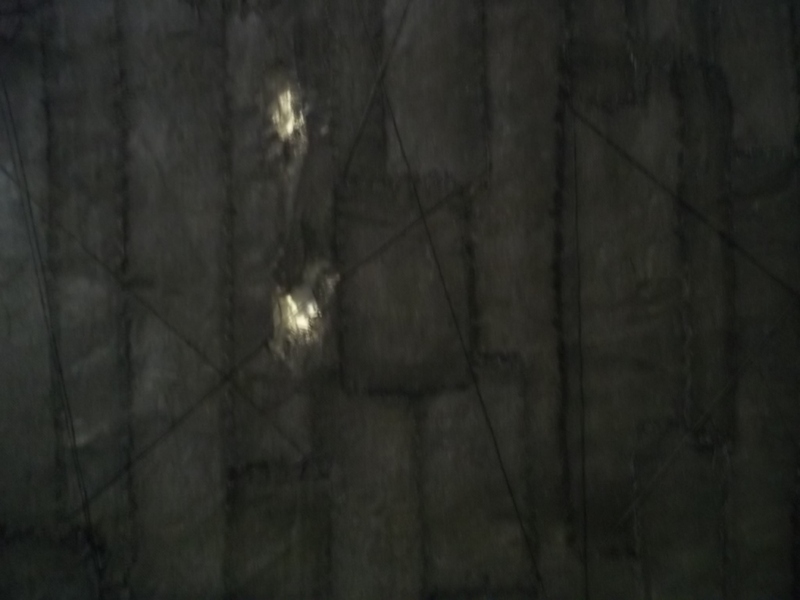 There were also a few problems with threads of the hessian coming up with the fabric, but they were easily taken care of. I’m not sure of the weight of the hessian I used, but there were only few holes per inch; I can’t wait to experiment with different backing fabrics. I was keen to use as many textures as possible. I wanted the top two layers of the moor to be quite regular to contrast with a jumbled layer to represent the layer of trees behind the mill. I also wanted the mill to be quite regular. I’m sure I’ve over packed the stitches but as this was my first ever rag rug and I hadn’t much of a clue what I was doing, I’m not going to be too hard on myself! It measures 40cm x 74cm. I have to confess I am entirely thrilled and completely addicted!